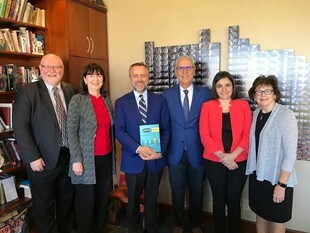 General Secretary for the Association of Evangelical Schools in Lebanon, Nabil Costa, was on campus November 9, 2018 to discuss the state of special education in the Middle East with Biola University’s School of Education and celebrate the recently published book Inclusive Classrooms for Community Flourishing. Costa, who is also the Chief Executive Officer for the Lebanese Society for Educational & Social Development, has partnered with the School of Education for more than five years on different initiatives to encourage inclusive classrooms in the Middle East. Costa, the president of SKILD: Smart Kids with Individual Learning Differences, saw a need for a book containing different strategies to aid students with learning differences. He called on June Hetzel, dean of the School of Education at Biola University, to lead the way. Hetzel co-edited the book with Robin LaBarbera, professor and director of special education at Biola, which was recently published by SKILD. “The Lord planted in my heart an urgency about this project because there are few resources in the Middle East to guide teachers in the service of special needs children, and so I made a commitment to the project on a very short timeline due to the Lord's prompting,” said Hetzel. The book, which was written for a general educational context and was translated from English to Arabic, is currently being distributed in schools in both Lebanon and Jordan. They have printed 2,000 copies thus far, and most of them have already been dispersed. “We wanted strategies to help our schools — public and private — so Dr. June invited different specialists in different specialties, and everyone wrote a chapter on [their] specialty,” said Costa. Twelve Biola faculty members contributed to the book based on their areas of expertise, in addition to Hetzel and LaBarbera, professor and assistant dean of the School of Education. The following professors contributed to the book: associate professor and director of elementary education, Carolyn Bishop; professor and director of secondary education, Dennis Eastman; professors of education, Tim StraJenna Canillas, Denise Reid and Mickie Wong-Lo; professors of communication sciences and disorders, Tonya Dantuma and Lori Newport; assistant director of nursing, Julie Neiggemann; and director of nursing, Rachel Van Niekerk. The book also included contributions from Biola students and professors from California State University, Fullerton; California Polytechnic State University, Pomona; and Haigazian University in Beirut, Lebanon. Costa penned the preface where he explains the intentions of the book — to show respect for students with learning differences and to guide instructors and parents. Costa explains that the Biola team had a good understanding of what to include in the book because members had travelled to Lebanon at least five or six times before. The connection between Biola and SKILD will continue and, as Costa hopes, grow. He notes the prominence of research in the U.S. and that the Biola team regularly shares recent discoveries made in the field with them. Biola faculty will soon travel east to attend a upcoming conference in Beirut focusing on education and how to work with students with learning differences. Written by Monica Kochan, iBiola reporter. For more information, please contact Jenna Loumagne, Manager of Media Relations, at jenna.loumagne@biola.edu or via phone at (562) 777-4061.